FIPA sheet metal vacuum cups are a success with their long lifetime! Their long service life is enabled by means of a new high wear- and oil-resistant NBR material and a special vacuum cup design which minimises the load on the vacuum cup during handling. 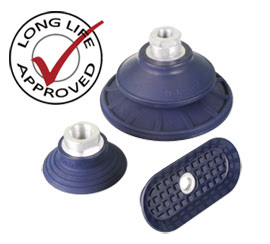 The FIPA sheet metal vacuum cups' long service life is a success due to excellent wear-resistance that comes with its strength for holding heavy loads and the absorption of lateral forces, as well as being free of paint wetting impairment substances (PWIS). Read more: FIPA sheet metal vacuum cups are a success with their long lifetime! Indispensable for automation experts: FIPA GmbH (http://www.fipa.com) is offering a comprehensive compendium of vacuum technology in the new VT01 Vacuum Technology Catalogue. “The new catalogue underscores our goal of offering the right solution for every need and for every industry in impressive form”, says Rainer Mehrer, CEO at FIPA.